I've been in a deep gloom for the last eight days. First there was the Selfishness & Ingratitude Rally in Jerusalem. Then there was that appalling video. Then a shul that I was very involved in developing turned into a campaign center for Abutbul and for perpetuating the Persecution Libel. Then Rabbi Ari Enkin (author of the Daled Amos Shel Halachah series) was screamed at by the principal of a local charedi elementary school that he has to vote for Abutbul because Rav Steinman said so, and when Rabbi Enkin responded that he doesn't need to follow Rav Steinman, the principal screamed at him that he is an apikores and then, in full view of a crowd of horrified onlookers, slapped him across the face. And today there is a Selfishness & Ingratitude Rally in Manhattan, publicized with a logo displaying the Torah surrounded by barbed wire. I didn't think that I could get any more depressed about the state of Orthodox Judaism. But I was wrong! I could get even more depressed! Today, I was speaking with a Rosh Yeshivah who had been inclined to bring his yeshivah to the rally in Jerusalem, but then changed his mind. Still, he decided that his students could recite the Tehillim in the yeshivah. After all, what could be wrong with saying Tehillim? Ah, the beauty of hundreds of thousands of Jews simultaneously saying Tehillim! Then he looked at which Tehillim were being recited at the rally. Shefoch chamoscha al hagoyim?! This is what Orthodox Jews are reciting against the Government of Israel?! What has become of us?! From the YouTube description: As Shabbat began last week, these soldiers had already set sail to stop Iran's weapons shipment from reaching Gaza terrorists. In the middle of the sea, they all sang "Shalom Aleichem" -- a Shabbat song meaning "peace be upon you." Days later, their successful mission brought peace upon the entire nation of Israel. They are our heroes. Interesting. Why is the tehillim wrong which they said. Arent the majority of them heathens? Do they keep torah and Mitzvas? No. 2nd-one person does one thing wrong so all hareidim are bad? In a park in RBS their is terrible graffitti written on it about hareidim. We can assume it was Eli Cohen supporters. Are they all graffiti artists and rashaim? No so whats good for the goose is good for the gander. 3-Yes, its very nice the soldiers sang shabbat songs. Their are plenty of reform and conservative jews that also sing shabbat songs and then are mechalel shabbos and have heretical views. Should we also be jumping up and down for joy or crying that that is the matzav of the generation. You hate hareidim so much that if a non hareidi would be caught doing a terrible act vs a hareidi helping an old man cross the street, you would find an excuse for the non haredi and condemn the hareidi. We must stand up and condemn this repugnant fanaticism before we enter a black hole of anarchy and violence. And let us remember that if a prominent haredi educator has carried out an act of violence, this speaks volumes for the level of fanaticism in the haredi world. Rabbi Slifkin, kol hakavod for your efforts and do not be cowed. We know that you are not against your fellow Jews of whatever stripe. You properly condemn the fact that too many of the haredi fanatics are against other hashkafot. "Arent the majority of them heathens?" No. They are lax in observance. That does not make one a heathen. "You can no longer talk lashon hara"
I think that you must have read the post in haste. The chapter recited is not a request for repentance. It is a request that God destroy those who are trying to kill us spiritually and physically. Beside the fact that there are range of observances among the non-Charedim. So a person in a leadership position should held to a lower standard than an anonymous petty vandal, and public acts of personal violence should be tolerated. Got it. That Jews of various views are fighting together to protect Israel rather than being led like lambs to the slaughter? Of course we should celebrate! You ran out of arguments so you resort to the ad hominem. No need to respond to that. The words of "Mike" are indicative of the brainwashing that has gone on in the chareidi world. He is a young man who has never met anyone outside his narrow circle. YES- we should be jumping up an down from joy when "reform and conservative" jews sign shabbat songs, regardless of their acts. So, nothing that a non-chareidi does is worthwhile? But he ,and all the others miss the main point. It is only in the chareidi world that we see hatred and fabrication, lies and vilification. It is only in the chareidi world that we see a total lack of "hakoras hatov". No one on the other side has called the chareidim Amalek and Hman, Hitler and kofrim. Yet, you see this every day about Rabbi Lipman, Rav Druckman ,Bennett and others. In a differetn blog, this real division is lamented and I go along with many who say that the first step is not to give a penny to any of the mosdos whose leaders have [articipated in this travesy of yiddishkeit. But, deep down, the problem is more profound. All of these acts would not hsve been possible if there did not exist the newfangled (and erroneous) idea of "Daas Torah". This total requirement of the abdication of one's senses is a perversion of yiddishkeit and mesorah. The chareidi world can onyl exist when they exercise an iron discipline- and they do this by being "moreh shelo kehalocho" (as far as kollel adn working goes) and by having established an artificial and false norm of "Daas Torah"
A complete police investigation needs to be carried out regarding this pre-election attack. Is this not the crudest form of religio-political intimidation? ploni- how do you know whether it was already shabbat when this video was taken? Maybe thesingers made early shabbat and the video taker did not. ploni, I guess we can take the heter that the Gedolim used to benefit from all the chilul Shabos that the police did to prepare for their rally last Sunday. Regarding any possible hillul Shabbat with the creation of the video can we assume a Druze or other non Jewish sailor took the video?. I spent four years as a Hillel director at the University of California Riverside. I was taunted, jeered, accused of being a Nazi, spat upon and even the victim of an attempted assault simply for supporting Israel's right to exist as a Democratic State. Why do we care that 35,000 Orthodox Jews protested against Israel in Manhattan today? It's pretty simple. ALL that time fighting the PR war and all that suffering was negated today. The masses don't understand the difference between a "Teffilah" gathering and a protest. All THEY see is 35,000 religious Jews attacking Israel for denying their religious liberty. If Israel doesn't provide freedom from its Jewish residents, how can anyone argue that they treat their non-Jewish residents appropriately? And let's not forget that MY sacrifice and my suffering pale in comparison to the experience of each and EVERY member of the IDF who out their lives on the line, day after day. I really don't understand the "Selfishness & Ingratitude Rally" label. The rally was only organized after the government crossed a line and imposed a jail sentence on an activity that was previously exempt from receiving jail sentence for 60 years. No rally was organized when steep cuts were made in the child allowances--which primarily affected chareidi families. No rally was organized when steep cuts were made in yeshivah funding. The clear implication is that Chareidim weren't rallying for the right to be financially supported. They were rallying for the right to be left alone to study Torah--just as they had been given the right to be left alone since the founding of the State. To frame this jail sentence as one for simple draft-dodging and not for studying Torah is disingenuously ignoring the context. You are failing to acknowledge that before a month ago, you wouldn't be considered a draft dodger and you wouldn't be jailed if you were learning Torah. In my book, that sudden shift in what is considered draft-dodging effectively amounts to jailing someone for learning Torah. Sorry, are we referring to R' Ari Enkin formerly of Montreal? Who writes the columns in Gil Student's blog? Slapped across the face by an elementary school principal over a matter of hashkafa? I can't think of a reason not to publish the name of this so-called educator. "No one here seems to have any problem with the fact that the video (showing the wonderful state of Jewish observance in the IDF) was taken on Shabbat"
There are non-Jews in the Israeli army, navy and air force. They don't have to serve, but they want to. Interesting, huh? So, Ploni, you are concerned about what you call the state of observance in the IDF? Wow, your Neshama and outlook is so similar to Rav Levi Yitzchak of Berditchev. What was the point of learning all those wonderful stories about seeing the beauty in the actions of Jews --- was that just something that you just did when you were achild? But now that you can actually see people who, in the midst of a mission, stop to say Shalom Aleichem, you want to condemn them? Shame on you! You are concerned about lack of frumkeit in the IDF? Hey, guess what can raise that level of frumkeit? How about if frum people go to the IDF? There is no logical excuse for continuing to defend the notion that as long as you wear a white shirt and black hat, you should not have to serve to defend your country which is under siege. The best you can come up with is this ridiculous circular argument in which those who you feel are the 'frummest' don't go to the IDF and then condemn the IDF for being a collection of individuals who are not as frum as they are. Ploni, stay hidden as you are obviously unaware that there are many non jews in the army to. I fully understand your feelings regarding all of this. It is particularly distressing when people who claim to have higher standards than everyone else suddenly say "well, everyone else acts like this so why can't we". But that is precisely the point! Jews both inside and outside the group perceive the contradiction. Young people will draw the appropriate conclusions. Rav Natan Lopes Cardozo maintains that the Orthodox world, particularly the Haredim, but not only them, is facing a major crisis in faith among the youth and could be heading towards a massive outflow of young people from the Orthodox world, such as happened in the 19th and 20th centuries. Yes, the Orthodox world seems bigger and more powerful than ever, yet Rav Cardozo talks to a lot of people and he says the level of religious faith among many of the young religious Jews is VERY shallow. No doubt there are many who walk around wearing all the garb but inside they are filled with cynicism and bad midot. The terrible manifestations Rav Slifkin has mentioned could be a manifestation of it. The bottom line is that we must keep our eyes fixed on the big picture. Torah is undergoing a massive shift in the way it is perceived due to post-Modernist thinking which has both positive and negative aspects to it. Many people are terrified by rapidly changing societal values and this brings extremism to the fore. I believe the Dati Leumi community and its educators are the best equipped to confront this and they will be the most successful in inculcating a view of Torah that can cope with these massive changes. The attempt to deal with this simply by being more and more extreme and trying to build higher and higher walls that we see ultimately can't work. One of the main arguments that I see by made by the Haredim is that "the secular are trying to impose their values on the religious" (This is not true, of course, but for the sake of argument I will continue with this line). Well, if you demand religious freedom for yourself, then by the rules of the modern world we live in, you have to be willing to grant the same to everyone else. One can not demand priviledges and rights for oneslf but then refuse to grant them to others. A good example is the "Women of the Wall". THEY ARE ALSO DEMANDING RELIGIOUS FREEDOM FOR THEMSELVES. As they see it, the Kotel is NOT an Orhtodox synagogue and was not set up as a prayer site as such , so the WOW want religious freedom for themselves as well. Similarly, if a non-religious Jew moves into Benei Braq or Beitar Illit, according to the Haredi demand for "religious freedom", this person would have the right to drive on Shabbat there and live his lifestyle they way he wants as well. What about the following grand bargain? : The Haredim would be recognized as a community that, for reasons of concience can not recognize the legitimacy of the state and its insitutions and would thus be exempted from military or other forms of state service and would be allowed to work without requiring IDF service. IN RETURN, the Haredim would no longer get any special budgets or allotments or tax exemptions or housing arrangements. (Naturally, Haredim and Haredi institutions that do agree to do service would not fall into this category). They would get what all citizens of the state are entitled to, but not more. They would either withdraw from the Chief Rabbinate, and should the secular population demand its abolishment along with all forms of religious legislations and what is called "religious coercion", the Haredim would agree to ending ALL restrictions on public transportation and business on Shabbat, Hametz would be sold on Pesach to everyone who wants it, civil marriage and all other non-conventional marriages would be allowed, and non-kosher meat would be imported and sold freely. Would the Haredim who oppose IDF service and who "want to be left alone" agree to this grand bargain? I don't know if this is a helpful way to look at things or not, but the way these people are acting is the way people act at a football game after drinking a case or two of beer. The fact that the NFL is a multi-billion dollar business (sorry, non-Americans, I'm going to write about what I know) gives evidence to the fact that there is some basic, male urge to let loose sometimes, to scream and shout for the home team, and sometimes let passions get out of control. I think sports performs a useful service by channeling these feelings in a relatively peaceful way. In the haredi world, they deny themselves the ability to play or watch sports. But low and behold, there's politics - with the endorsement of the gedolim, no less! Here, they can get excited, yell, scream, put up signs, hold rallies, and occasionally hit, all in the service of HaKadosh Boruch Hu. And in sports, there always has to be an enemy. Here, we Jews really excel, with our millenium of experience in identifying and overcoming enemies - Pharoh, Amalek, Nebukadnezer, Haman - the list goes on and on. So today, there's Lapid, Lipman, and Slifkin. It's just that sporting instinct in action. Just consider yourself the Bill Belichick of Orthodox Judaism (you can look him up if you like - greatest NFL coach of his time, and widely hated). And while I can understand not wanting to be in the same company as people like Pharoh and Amalek (not to mention Belichick), I personally would take pride in being in the same company as people like Dov Lipman and David Morris, people who have been labelled "rashas" by some of the more rambunctious fans of team "H." I won't mention Lapid, as I will acknowledge that he is controversal even for team "DL". But, to take a larger view, team "C" once placed some great men (Galileo, Darwin) on the "hate" list. Belichick, Morris, Galileo - not bad company if you ask me. I think an important factor in the lack of hakara hatov displayed by chareidim is based on the religious idea of not putting faith in kochi v'otzem yadi, personal strength. Perhaps they feel the army and such do believe only in personal strength. This is of course not true for very many who serve the country. But more than that, what basically emerges is that some chareidim think that it is in their merit that things go well and that they are upkeeping the world. It is a religiously sanctified kochi v'otzem yadi. > The rally was only organized after the government crossed a line and imposed a jail sentence on an activity that was previously exempt from receiving jail sentence for 60 years. What line did they cross? This was/is an unfair law since day 1, and the government has apparently decided that enough is enough. But these cuts were called 'Gezeiros' and comparisons were made in many Haredi publications to 'Bayamim Ha'hem Bazman Hazeh' (this was around Chanukah time), implication being that that the point of the cuts was to uproot Torah. I am not Haredi but have also been adversely affected by these cuts. I do not consider them 'Gezeiros'. > No rally was organized when steep cuts were made in yeshivah funding. > The clear implication is that Chareidim weren't rallying for the right to be financially supported. They were rallying for the right to be left alone to study Torah--just as they had been given the right to be left alone since the founding of the State. From where do they get this 'right to be left alone'? Other segments of the population are contributing to the safety and upkeep of the country - a country which the haredim benefit greatly from whether they like it or not. All that is being asked is that they do their fair share. > To frame this jail sentence as one for simple draft-dodging and not for studying Torah is disingenuously ignoring the context. As R' Natan has eloquently pointed out - if someone does not pay their taxes because they are giving their tax money to charity and are then sent to jail - are they being jailed for giving charity? No, they are being jailed for NOT paying their taxes. > You are failing to acknowledge that before a month ago, you wouldn't be considered a draft dodger and you wouldn't be jailed if you were learning Torah. Because an unfair law has been changed. Just like at one time you could talk on a cellphone while driving without it being an offense, and now you cannot. Laws are passed all the time. > In my book, that sudden shift in what is considered draft-dodging effectively amounts to jailing someone for learning Torah. I really don't understand the "Selfishness & Ingratitude Rally" label. The rally was only organized after the government crossed a line and imposed a jail sentence on an activity that was previously exempt from receiving jail sentence for 60 years. And your implication then is that the Hareidi leadership has abandoned its demand for unconditional financial support? That would be big news. More likely the leadership is smart enough to realize that a rally demanding full financial support with no obligations, in addition to exemption from army service, would have been utterly repulsive to most Israelis and many North American Hereidim. And how is a demand for service exemption only for their own not selfish? Since implications are your thing, what do you think reciting a Psalm at a rally protesting measures by the State of Israel containing, "How long, O Lord, will You be angry...Pour out Your fury on the nations that do not know You, upon the kingdoms that do not invoke Your name..." actually implies? A possible implication one can think of is that anyone who did not think twice about effectively cursing the Jewish state and the majority of its people in front of the entire World has gone beyond the proverbial Pale and can no longer be trusted to interpret Torah. can we have link/source/fact check on the shfoch chamatcha claim? other sources at rally deny it happened. thanks. In the New York rally, the order of the Tehillim was different, and 79 was recited 6th instead of 1st. Careful there. Another possible gezeira, an attempt to uproot Torah learning by prohibiting Jewish Observer from discussing an important sugyia whilst speeding down Highway 1. Perhaps an exemption for kollel students can be made. They are like spoiled children, who have been used to getting their way for a long time, who explode when the free ride ends. Limits need to be set, tough love is in order. However, it is important to try to maintain calm at the same time and keep in mind that the goal, as in the case of spoiled children, is to try to be mechanech them, to train them to live properly, rather than just getting back at them for misbehavior. Let us pray for success in the difficult, but very important, task. I tried posting yesterday but it didn't go through. Can you explain why you are so sure that they were referring to the State of Israel? Wouldn't it be more logical to assume that they were referring to the enemies of Israel that make the IDF necessary and that they were davening for the coming of Moshiach that will render the draft unnecessary? Because it was not an event about the safety of Israel. It was an event protesting the Government. It is sad that some people seem to think that the Rabbinate is a papal college of cardinals or a conclave of mullahs, Iran style. Not sure why there is a need to demand that you vote in a particular way because an authority has told you to do so without question & get physical when challenged about it. Doesn't seem very 'us' to be honest. I appreciate this video and the actions of this unit, by preventing arms to terrorists, have clearly saved many lives. The IDF is considered in high regard among defence forces across the world for its professionalism and abilities. It is the last and final defence of the Jewish homeland and if it falls in war, Israel falls. So yes they are heros, these young people, who as we say in Britain are giving 'their today for our tomorrow'. And unlike Mike, I'd rather have Reform Jews and Conservative Jews & secular Jews reaching out and praying to Israel's G-d than a foreign idol. The Shema, which I recited this morning states that G-d is the One Lord of all the people of Israel, not just for one part of Judaism. I don't frequently add my comments to this or any web site. I let me wife do it instead as she's much more articulate than me. But an item on Yeshiva World News today (http://www.theyeshivaworld.com/news/headlines-breaking-stories/218920/hagon-haravrav-wosner-vote-for-a-chareidi-mayor-in-beit-shemesh.html) really got to me. It was titled: "Hagon HaRavRav (sic) Wosner: Vote for a Chareidi Mayor in Beit Shemesh". I had to respond. I wrote that this reminded me of an election in the USA in 2008 where people were told to vote for the black man, because he was black. 3 houres later and I'm still waiting to see that comment published. Maybe they just forgot about me. "What line did they cross? This was/is an unfair law since day 1, and the government has apparently decided that enough is enough." I though I was clear. The line they crossed was suddenly eliminating Torah study from being eligible for draft deferral and rendering it grounds for imprisonment. As you yourself acknowledged, a jail sentence is not exactly the only way nor the most productive way diffuse this situation. There may be other values of a society that override equality in some aspects. "But these cuts were called 'Gezeiros' and comparisons were made in many Haredi publications to 'Bayamim Ha'hem Bazman Hazeh' (this was around Chanukah time), implication being that that the point of the cuts was to uproot Torah. I am not Haredi but have also been adversely affected by these cuts. I do not consider them 'Gezeiros'." Totally besides the point I was making. Rabbi Slifkin labeled the rally a "Selfish ad Ingratitude Rally" when in fact, such 'gezeiros' were NOT being protested by the rally at all. Please respond to the point. "From where do they get this 'right to be left alone'?" From the Status Quo understanding. Communities who pre-dated the State of Israel have the right to continue their way of life (uninhibited by jail sentences). 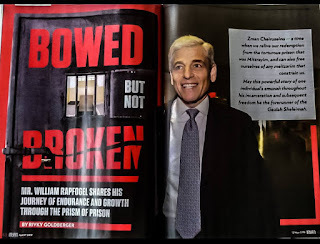 "As R' Natan has eloquently pointed out - if someone does not pay their taxes because they are giving their tax money to charity and are then sent to jail - are they being jailed for giving charity? No, they are being jailed for NOT paying their taxes." Rabbi Slifkin's analogy is not appropriate. The more appropriate scenario would be where tax exemptions used to be issued routinely to non-profits because they are raising money for a worthy cause and they not getting wealthy from it. It was a morally justified tax exemption. But suddenly, the government stops issuing the tax exemption and thereby immorally forces the non-profit into bankruptcy if it complies and pays the taxes. I think under those circumstances, it would be fair to say the government is sending these people to jail for running a non-profit charity organization. "Because an unfair law has been changed. Just like at one time you could talk on a cellphone while driving without it being an offense, and now you cannot. Laws are passed all the time." See comment about Status Quo above. I didn't think that I could get any more depressed about the state of Orthodox Judaism. "Orthodox Judaism" was practiced, and taught, at Yeshiva University twenty or thirty years ago. Maybe it still is, by some faculty. "Haredism" is something different. That's what you're seeing. It seems to be growing, both in Israel and the US. And it's depressing a lot of people, including me. Honestly now, Jewish Observer, are you repeating the "jail for Torah study" slander in an attempt to save the dignity of those who came up or went along with this inane PR cheese? Regrettable egg on the faces of some very Big Men who should use their noggins before speaking, but life goes on and your doubling-down will only invite further hilarity and disgust. But it's your life. ....the Status Quo understanding. Communities who pre-dated the State of Israel have the right to continue their way of life (uninhibited by jail sentences). PS: All the best for your town's mayoral election, R'Slifkin. May you get a real mayor this time around. Or at the very least, that the electoral machinery got dredged of slime build-up. I'm afraid your classical prose is not an adequate substitute for substance. That said, I do find your writing style immensely entertaining--especially the witty insults and the Slifkin cheer-leading.